ACT NOW is an exciting, improvisational movie-making program for girls ages 10-14 years old Our original technique, the MOVIExperience, is a fun week of improvisation, location scouting, brainstorming, storytelling, and hands-on movie-making. The girls do all of the on-screen and most of the behind the scenes jobs as well. ACT NOW movies themes take up what matters most to the girls; they are entertaining, educational and professionally produced. Playshops take place from 9 am to 4 pm, Monday through Friday. At the end of each Playshop, a public screening of the original movie reveals hidden capacities and talents in every participant, allowing formerly passive viewers to become active makers. ACT NOW playshops build confidence and character in girls, and are empowering, engaging, and fun! 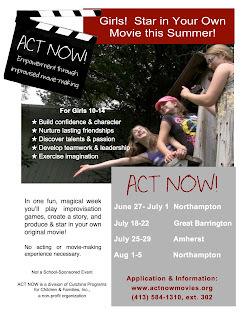 Send Your Daughter to ACT NOW MovieExperience this Summer- Be a Star in your own movie!